Red-Eyes Slash Dragon is a Level 7 Dark Dragon-type Fusion Monster with 2800 Atk and 2400 Def. Also, great name. Existing in the Extra Deck poses some problems, but Red-Eyes decks in general can only put out one Fusion Monster at a time with their Fusion Spell, so Link Monsters aren’t as necessary. The first effect is to equip itself with Warriors when it declares an attack. If it declares multiple attacks, you get multiple monsters. Each monster equipped through this effect gives it 200 more Atk, but I don’t expect this monster’s Atk to get too high. As a Quick Effect you get to send any Equip Card to the grave to negate and destroy a monster targeting effect. This effect does not target, and non-targeting destruction is great. The fuel for this effect does not have to be monster equipped by the first effect, but as usual, it does nothing against Kaijus. The final effect is that Red-Eyes Slash Dragon can swarm the field if it had monsters equipped to it when it’s destroyed by battle or effect. Either player can trigger the effect so OTKs are possible. With so many effects, we’d think we have the best of the Red-Eyes Fusion Monsters. However, comparing it to Meteor, I’d rather for Meteor. 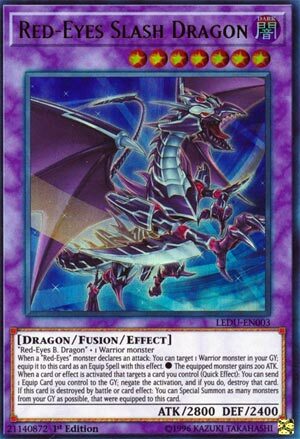 Also it requires Red-Eyes B Dragon and not a generic Red-Eyes monster to properly Fusion Summon. Still strong with protection and worth running in a Red-Eyes Fusion Deck. The new Red-Eyes fusion is on the chopping block to be reviewed today, and he is a great card that synergizes with the new Red-Eyes cards very well, Red-Eyes Slash Dragon. Slash Dragon requires Red-Eyes B. Dragon and a Warrior, which is easy to obtain since Red-Eyes got their own Warrior monster in Gearfried the Red-Eyes Iron Knight, plus you are playing Red-Eyes B. Dragon in the Red-Eyes deck, it is a must. When a Red-Eyes monster you control attacks, you can equip a Warrior from the GY to this card, which in-turn boosts Slash Dragon by 200 ATK. When a card/effect is activated that targets a card you control (Quick Effect): you can send an equip card you control to the GY to negate and destroy that card. So many effects target in 2017, negating some of those effects will be great for you and terrible for your opponent. Also, if this card is destroyed, you can summon as many monsters from the GY as possible that were equipped to Slash Dragon when it died. Nice little back-up for when your opponent outs your Slash Dragon in a way that isn’t a Kaiju. The newest Fusion for the Red-Eyes deck is probably one of the best. Play it, and maybe splash in a Bamboo Sword engine to get more plusses. We are getting a new Bamboo Sword very soon anyways.